Today Mike Hyatt—blogger, entrepreneur, and leadership guru—encouraged his readers to formulate an Ideal Week, a flexible schedule that prioritizes daily events to maximize effectiveness. 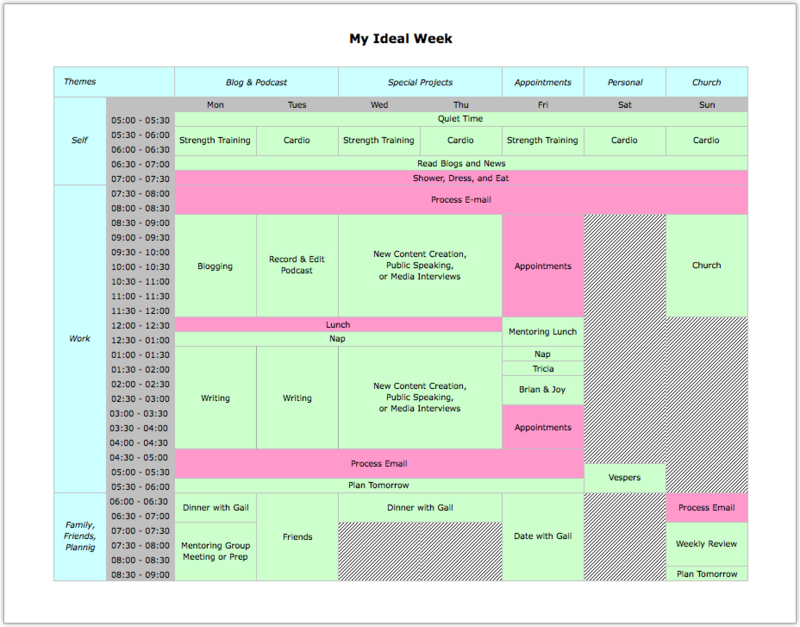 As an example, he shared his own Ideal Week: seen here. Right away, I realized that this might explain why I am less successful than Mike Hyatt. First of all, my Ideal Week would not include anything about content creation or cardio workouts, but would instead read: WIN THE LOTTERY!!! PAY FOR ALL MY FRIENDS’ ADOPTIONS!!! EAT A ROLL OF REFRIGERATED COOKIE DOUGH!!! BUILD ONE OF THOSE TREEHOUSES FROM PINTEREST IN THE BACKYARD!!! What about you? Do you ever achieve your Ideal Week? What does your Actual Week include that your Ideal Week doesn't.